We have been back in Freising in Bavaria (Southern Germany) for a few days, enjoying some time with family before heading off on the rest of our photo shoot soon. Although today has dawned wet and cold, we set off to the Saturday Farmers Market in downtown Freising. Although there are no vehicles allowed through the centre of town during market day, the people are definitely on a mission as they walk briskly from one stall to the next. There are even more people arriving by the minute on bicycle. From early Saturday afternoon until Monday morning, the shops in Germany are closed so every man and his dog is out to catch up on last minute shopping of fresh produce, meat, fish, and flowers (whatever you like). This Monday happens to be a public holiday (May 1st) here in Germany so the markets were busier than usual because of the long weekend. 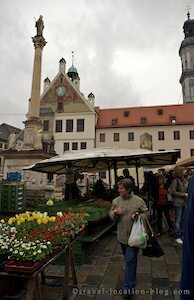 Saturday Farmers Market at the Marienplatz in Freising, Bavaria, Germany, Europe.